The AyrMesh Bridge is built for pole mounting; unlike the Hub, there is no "snap-on" bracket for mounting to a flat surface. 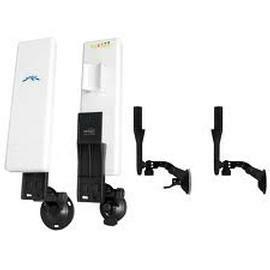 This is a very clever device that is built specifically for the Receiver (Ubiquiti manufactures all our hardware) and allows it to be mounted on a flat wall or on the inside or outside of a window. I'm not completely sure I would depend on a plastic suction cup to hold the Receiver over the long haul, but it can be very useful for short periods of time (days, weeks) as a temporary measure while you put together something better. This is an excellent general-purpose mount. In all fairness, a lot of different companies make mounts like this and I have seen similar items in Home Depot, Lowe's, and Menard's.